Unless you're a huge fan of dubstep and Michael Bay movies, you probably weren't too excited after this year's E3 press briefings. It was an especially disappointing slew of conferences for role-playing game fans, who were greeted by precisely zero new RPG announcements. Everything was very brown. The industry seemed locked into a future of shooting and throat stabbing. It's kind of surreal that if not for Kotaku, we might have heard nothing about Fire Emblem: Awakening at this year's E3. Here's what happened: After Nintendo's tepid 3DS Software Showcase on Wednesday night, Nintendo of America President Reggie Fils-Aime came over to chat with Kotaku editor-in-chief Stephen Totilo. As we were talking, I asked if Fire Emblem would be coming to America. "It's coming," he said. I did a double take: "Wait, Fire Emblem 3DS is coming to the U.S.?" He confirmed it again and said it was in the press materials. It wasn't. A few minutes after we spread the news, Nintendo tweeted that Fire Emblem: Awakening is indeed making its way here. Did they plan to make that announcement or did Reggie slip up? The world may never know. The next big thing from the creator of Final Fantasy is looking more and more intriguing every day. Publisher Xseed showed me some of the combat in this upcoming Wii RPG and I was really impressed by how it's handled. Battles are sort of like Valkyria Chronicles: you run around a battlefield, casting spells and slashing up goblins in real time. You can also hide behind corners like you're playing a stealth game, then pop up and shoot enemies with your crossbow or hack them up from behind. It's a neat amalgam of many different features from many different RPGs. Amazing Wii Battles. No US Release in Sight. I'll have more coverage on The Last Story next week. Although Paper Mario wasn't on the show floor this year, it did make appearances in two of Nintendo's press briefings. Awesome-looking appearances. You'll be hopping on enemies in traditional turn-based button timing Paper Mario style and using objects like fans and scissors to manipulate the game's two-dimensional world. And collecting stickers! The Paper Mario series has always been up there with the best of the best JRPG series. It's got warm humor and some really great design. I'm sure Sticker Star will follow suit. Not technically a new game, but you must watch this trailer for a glimpse at what next-gen Final Fantasy games could look like. 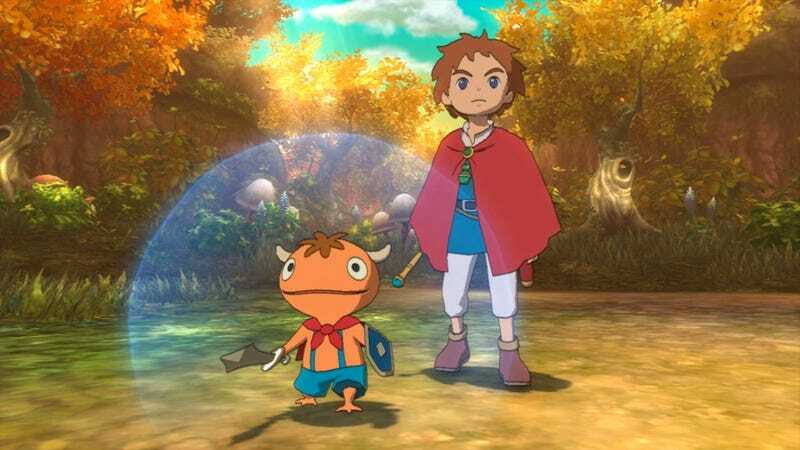 Playing Ni no Kuni is kind of like playing a movie by Studio Ghibli, the wonderful animation studio behind films like Howl's Moving Castle and My Neighbor Totoro. It plays sort of like Dragon Quest, and it's localized sort of like Dragon Quest too—the names are filled with animal puns and other cute pieces of wordplay. (One water spell is called Splish Slash.) In true Level-5 style, the game's dialogue is written out with bizarre accents and weird twists on words and dialects. And the voice acting is lovely! I'll have more coverage on Ni no Kuni next week. I didn't have enough time to check out this Little King's Story sequel, which is slated for Vita this summer, which is perhaps proof that there were loads and loads of RPGs to get through. Persona 4! Remake! On Vita! Out this fall! How can you not be psyched? I plan to buy a Vita just for this game. Atlus showed me the Japanese build and it's looking insanely colorful and neat. We shot some video of Persona 4 Golden's new features, so look out for that next week. I'm not the biggest Kingdom Hearts fan on the planet, but I still enjoy the occasional romp through Square Enix's convoluted story and Disney-filled worlds. Dream Drop Distance is looking pretty neat; the combat system reminds me more of Kingdom Hearts II than any of the other prequels or side-stories, which is definitely a good thing. This mobile RPG is about as old-school as it gets; on first glance, it looks just like Final Fantasy IV or Final Fantasy V. There are dungeons, job classes, random encounters, and all sorts of other nostalgia-packed goodness. No idea how the story is, or how the touchscreen controls will hold up over the long haul, but I'm pretty stoked to check out Final Fantasy Dimensions when it hits iPad, iPhone, and Android this summer. "Wait a minute," you're saying. "South Park isn't a JRPG." Well. You're technically right: South Park: The Stick of Truth was developed by Obsidian Entertainment, a studio based in Irvine, California. But its combat, equipment, and stats all feel like a genuine Japanese role-playing game. To be specific, it feels like Paper Mario. In other words, JRPG fans should be excited about this game. And all of the others. And all of the next year, really. It's an exciting year for the genre, and we can still expect localization news on big RPGs from Japan like Bravely Default: Flying Fairy and Dragon Quest X, both of which I'm sure will cross paths with U.S. gamers in the semi-near future. Plus many smaller JRPGs from companies like Atlus, Xseed, and Aksys that I haven't even mentioned yet. What's not to like?